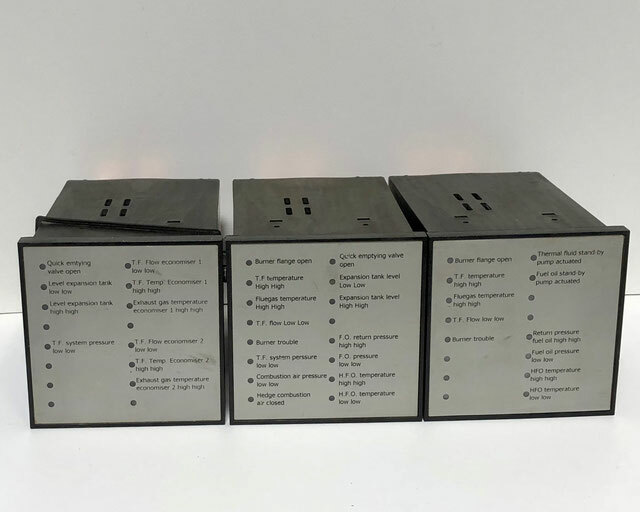 If you would like to receive an offer for a Wiesloch alarm unit or another item, then please email directly at sales@shipspares.nl or use the "REQUEST A QUOTATION" - FORM. Wiesloch/Aalborg alarm unit, Type 822400, Fb.Nr. : R21611014. 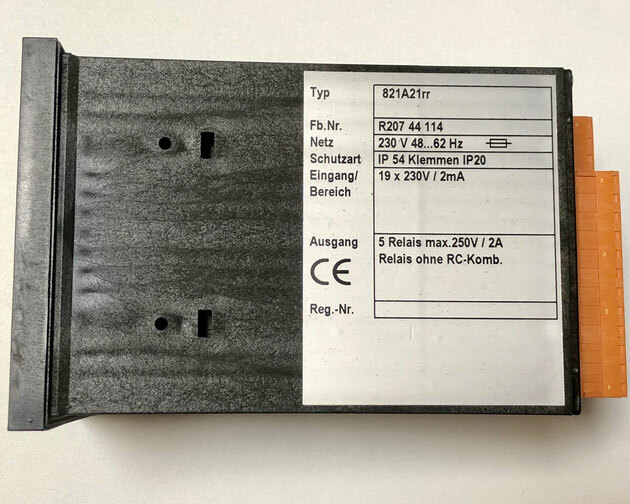 This alarm unit work on 230V 48…62Hz. The input is 19 x 230V/2mA and the output is 5 Relais max. 250V/2A. The alarm unit on the picture is able to give alarms for "Burner flange open", "T.F. temperature high high", "Fluegas temperature high high", "T.F. flow low low", "Burner trouble", "Level expansion tank high high", "Level expansion tank low low", "Quick emptying valve open", "F.O. pressure low low", "HFO temperature low low", "HFO temperature high high", and "F.O. return pressure high high". 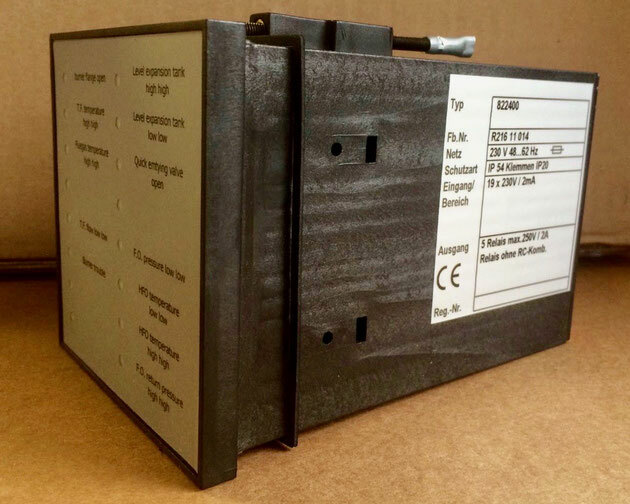 Wiesloch alarm unit, type r821A21rr-, Fb.Nr. : R20430079 . This alarm unit works on 230V 48…62Hz. The input is 19 x 230V/2mA and the output is 5 Relais max. 250V/2A. The alarm unit on the picture is able to give alarms for "Burner flange open", "T.F. temperature high high", "Fluegas temperature high high", "T.F. 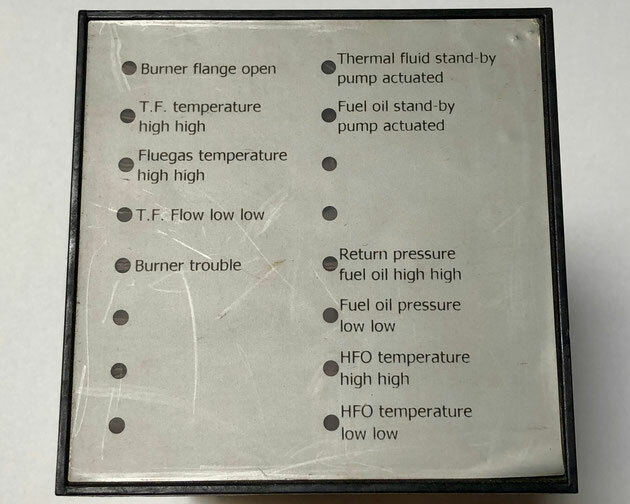 Flow low low", "Burner Trouble", "Thermal fluid stand-by pump actuated", "Fuel oil stand-by pump activated", "Return pressure fuel oil high high", "Fuel oil pressure low low", "HFO temperature high high", and "HFO temperature low low". 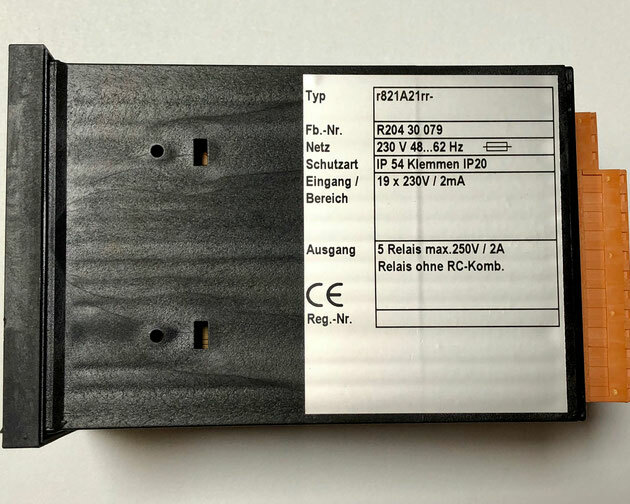 Wiesloch alarm unit, type 821A21rr, Fb.Nr. : R20744114. 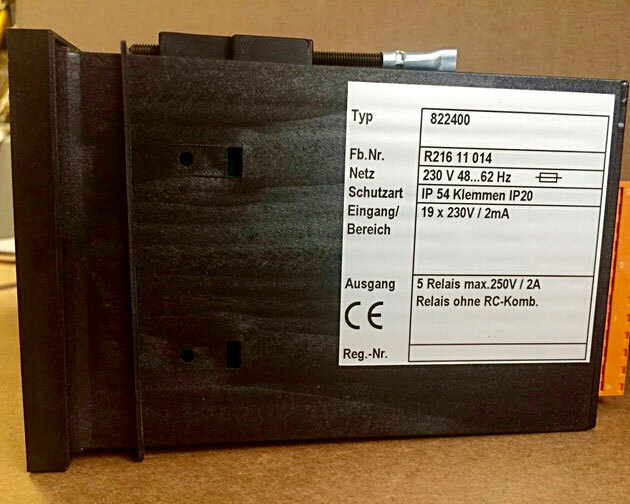 This alarm unit works on 230V 48…62Hz. The input is 19 x 230V/2mA and the output is 5 Relais max. 250V/2A. The alarm unit on the picture is able to give alarms for "Burner flange open", "T.F. temperature high high", "Fluegas temperature high high", "T.F. flow low low", "Burner trouble", "T.F. 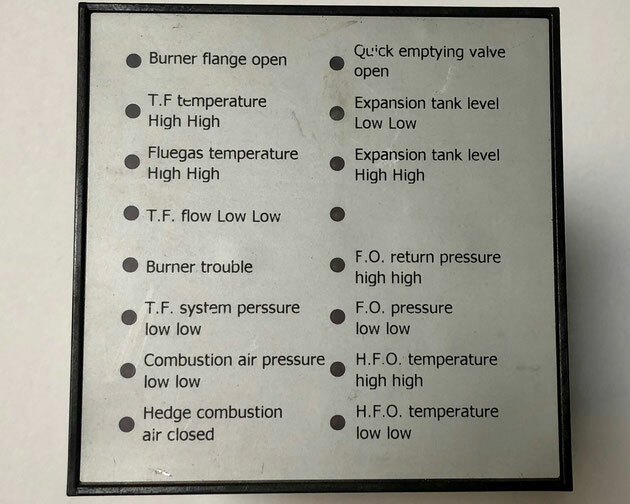 system pressure low low", "Combustion air pressure low low", Hedge combustion air closed", "Quick emptying valve open", "Expansion tank level low low", "Expansion tank level high high", "F.O. return pressure high high", "F.O. pressure low low", "H.F.O. temperature high high", and "H.F.O. temperature low low". 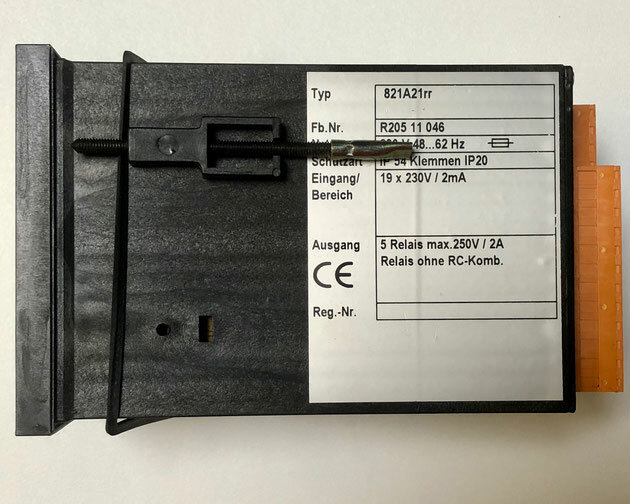 Wiesloch alarm unit, type r821A21rr, Fb.Nr. : R20511046. This alarm unit works on 230V 48…62Hz. The input is 19 x 230V/2mA and the output is 5 Relais max. 250V/2A. 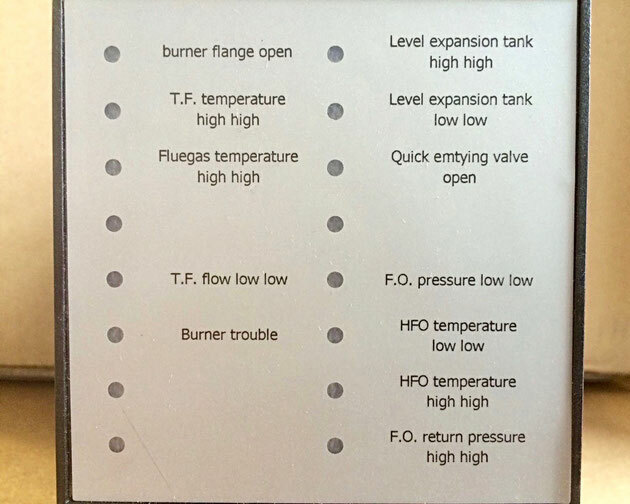 The alarm unit on the picture is able to give alarms for "Quick emptying valve open", "Level expansion tank low low", "Level expansion tank high high", "T.F. system pressure low low", "T.F. flow economiser 1 low low", "T.F. temp. 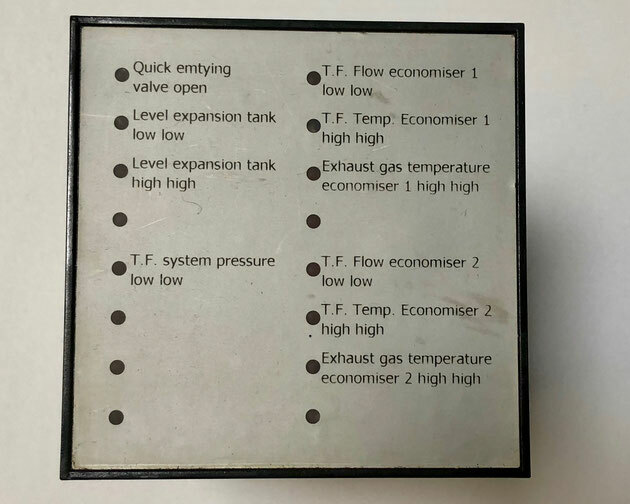 economiser 1 high high", "Exhaust gas temperature economiser 1 high high", "T.F. flow economiser 2 low low", "T.F. Temp. Economiser 2 high high", "Exhaust gas temperature economiser 2 high high".